I received this book for free from the GoodReads First Reads Program. This does not affect my opinion of the book or the content of my review. I was so excited to get a copy of this book. Just in case you didn't know, I have the most adorable kitty in the world (my husband agrees with me, so it must be true). Her name is Lunabelle. Isn't she adorable? We have talked about how we should share her adorableness with the world. We also would love to make loads and loads of money off of her. She needs to earn her keep (and pricey grain-free food). This book begins with asking the reader to identify what type of cat you have, so you can figure out what type of videos to make. 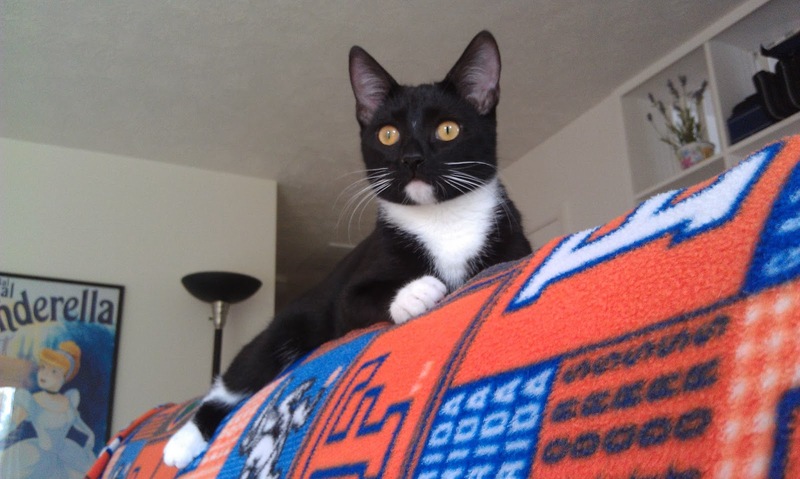 After carefully considering all of the options, I decided that Lunabelle was best described as a daredevil kitty. When my husband or I hear a crash, we know that Lunabelle went exploring. We are also always amazed how high Lunabelle can leap. 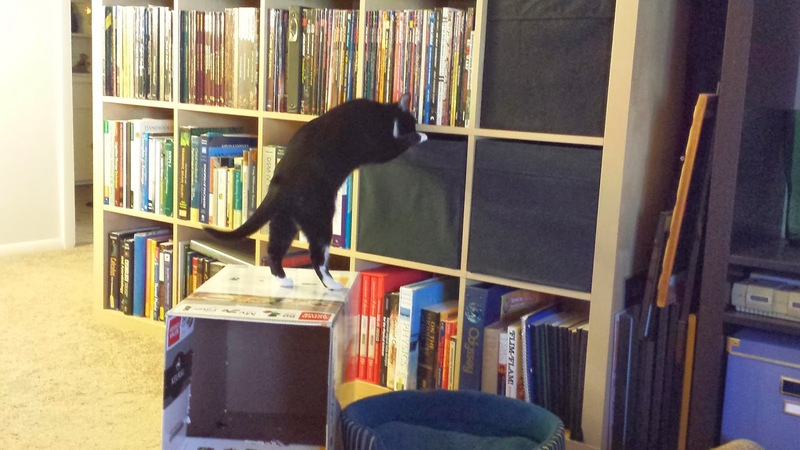 When we moved into our current apartment, we had to make sure that we didn't stack the boxes too high, because we knew that Lunabelle would use them as a starting block to get on top of the larger pieces of furniture. This wouldn't have been a big deal if we were certain she wouldn't hurt herself getting down or if we were certain that she didn't get stuck up there. 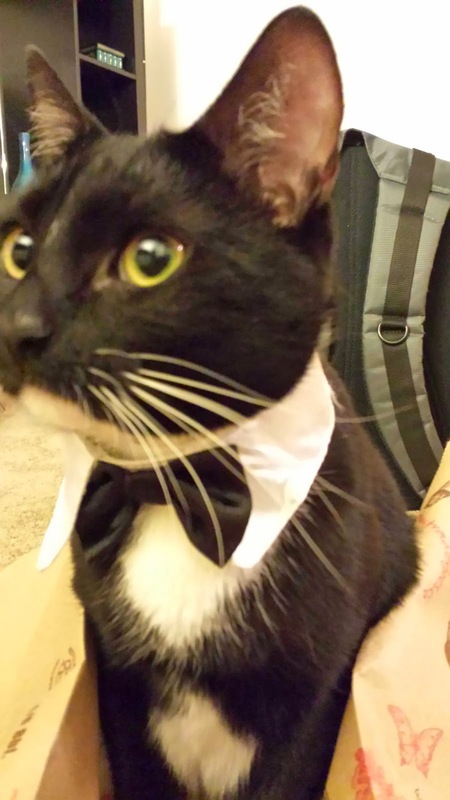 The next chapter recommends different types of accessories and ways to film your kitty. I know Lunabelle is adorable on her own, but she is even more adorable when she is playing with a bowl of water or tiny drink parasols or her Cat's Meow. Seriously, her cuteness factor multiples. The final two chapters discuss how to promote your cat on the Internet and how to deal with the diva cat that you will inevitably have once the popularity goes to your kitty's head. Right now, Lunabelle knows that my husband and I think she is the most adorable kitty in the world, so she knows that she can get away with murder. Once she gains Internet fame, there will be no living with her. In all seriousness, this book is really adorable and great for a laugh. 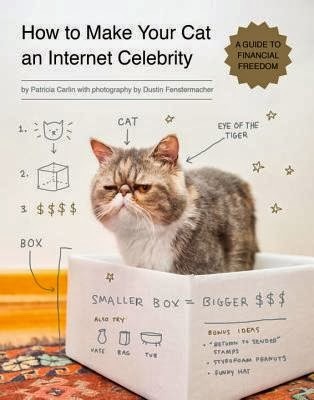 This is a humor book (not a serious guide), but it has a surprising amount of information if you wanted to turn your cat into an Internet celebrity. I was really impressed with it. If you have a kitty and are the type of person who reads all of those funny cat books or watch a lot of YouTube cat videos, this book is right up your alley. This is a great little book to give to a friend too. Obviously, this book gets 5 out of 5 kitties.